Let’s have some toast and talk about murder. Rodion Romanovich Raskolnikov is not a man to mess with - he has an axe and some challenging views on morality. Chris Hannan’s new adaptation distils the well over 500 pages of Dostoyevsky’s novel into just shy of 100 pages of play-text. I say distils rather than condenses, as what he has set out to capture here is what he believes to be the essence of the book. Members of the cast I have spoken to all seem to hold Chris in high reverence for the words he has given them. In his interview for the programme notes he describes the book as spiritual more than political, and the play certainly offers us a series of deeply philosophical arguments. We became suddenly acquainted with the rear wall of the Playhouse stage a year ago, in the closing scene of Colin Richmond’s designs for the Alchemist. For Crime and Punishment, Richmond has taken this wall as the canvas for his backdrop, in front of which he has created a stark, distressed, atmospheric space for the performance, with scene changes able to take place fluidly, keeping the action moving at a pace. A ten-strong cast not only play multiple roles but also create the soundscape that underpins the drama. A variety of instruments and sound-effects, from drums, pianos and bass through to rattling buckets, are ranged about the rear of the stage, where the cast remain throughout when they are not in a speaking role, forming a chorus, who watch and interact with the spectacle before them. 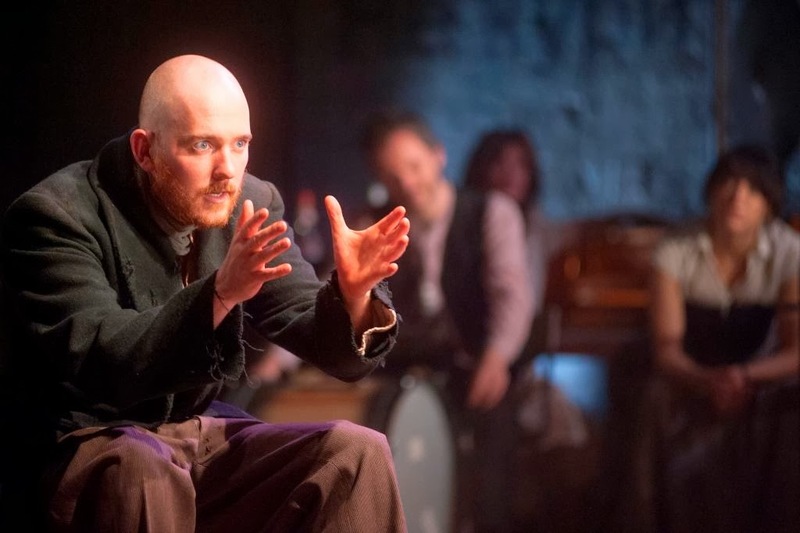 Try to congratulate Adam Best on his performance and he will shrug and try to deflect your attention to his colleagues, but his portrayal of Raskolnikov is genuinely mesmerising and I find myself at a loss for superlatives. This is a very complex character who, having decided that murder is his right and of benefit to all, spends the next two hours fighting with himself. You can see the inner punches as he reels and twitches about the stage and there is something terribly disturbing in his eyes. He is right, though, in pointing to his fellow actors. It is very much an ensemble piece and there are many tremendous gems in this jewel box of characters. Cate Hamer is not only the drooling, ill-fated pawnbroker Alyona but among her other roles is the splendidly wrought Katerina Marmeladova, whose reaction to the accidental death of her husband is truly astonishing. George Costigan treads a fine line in balancing the comedy of Marmeladov whilst John Paul Hurley brings menace to his Ilya Petrovich. Obioma Ugoala gives a quiet solidity to Raskolnikov’s loyal friend Razumichin, and his considerable stature comes in useful in scenes where Adam Best becomes almost a rag doll in his hands. Mabel Clements, Amiera Darwish, Chris Donald, Jessica Hardwick and Jack Lord complete the cast, and I could go on, but the list of their parts is seemingly endless. Suffice to say that the entire ensemble work together generously whilst producing a series of richly drawn characters. I have already mentioned the sound design, in which Nikola Kodjabashia uses the cast members to perform his score, which is a sonic landscape that blends with Colin Richmond’s designs and Chris Davey’s lighting to create an atmosphere maintaining the tension and the ebb and flow of the narrative. Dominic Hill’s direction brings remarkable lucidity and an overarching architecture to the piece, and we do feel that we have travelled the troubled journey with the cast, rather than just sitting watching them play it out. This is a hugely successful adaptation that very much achieves the sense of a piece written directly for the theatre. As a postscript I can now add that I have become something of a glutton for this form of punishment, having returned to see it again a number of times since writing this blog posting, and it simply gets better with repeat viewings. Crime and Punishment was co-produced by Citizen’s Theatre Glasgow, Liverpool Everyman and Playhouse and the Royal Lyceum Theatre Edinburgh. It runs at Liverpool Playhouse until Saturday 19th October 2013 after which it transfers to Edinburgh from 22nd October to 9th November. See the trailer here and visit www.everymanplayhouse.com for further details and ticket sales for Liverpool. See www.lyceum.org.uk for ticket sales for Edinburgh. 'Distils rather than condenses': nicely condensed! Indeed, this is always a potential - indeed the main -stumbling block with novel-to-stage transferences. I can imagine this to be especially the case with Crime and Punishment, laden as it is with complex and at times dizzying questions of morality and ethics. If the production has managed to maintain, or more precisely to visually and atmospherically convey, this essence, then it is a major feat. Nice review - should be more like it! How very kind! Glad you liked my review. This was an inspiring production and I hope I conveyed some of my enthusiasm for it.